AAMCO of Turnersville is a full-service auto repair and preventive maintenance center in Turnersville, New Jersey. While we are part of a large national team, we are independently owned and operated to bring you exceptional local customer service. 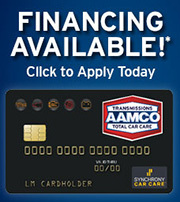 Get the AAMCO guaranteed service paired with the care and personality of your local repair shop. Since 1963, AAMCO car care centers have serviced over 20 million transmissions. Since we only hire highly trained and tenured mechanics, we’re proud to bring you the most reliable service. We have over 20 years of experience working on new cars and over 50 years’ experience in the automotive industry as a whole to bring you some of the best customer service available. All of our auto repair services in Turnersville come with a minimum of a one-year warranty. We’re that proud and sure of our work that if something happens, you’re covered. For your protection and peace of mind, we use only the highest quality parts available. When original equipment manufacturer (OEM) parts aren’t available or in some cases too expensive and superfluous for the job, we will recommend an equal-quality part. Capable of servicing all makes and models of foreign and domestic cars, trucks and SUVs, we also pride ourselves upon being the cost-effective alternative to your car’s dealership. Taking your vehicle to its manufacturer’s dealership for repair and maintenance can be a costly experience. AAMCO never overcharges you for parts and labor nor recommends extra repairs you don’t need. We’re in the business of taking care of you to get you back on the road quicker and safer. AAMCO of Turnersville provides complete transmission service and maintenance services for both automatic and manual transmissions. We also provide services such as transmission flush and filter replacement. Conveniently located in Turnersville, we offer free inspections on cars, trucks, and SUVs of all makes and models, imported and domestic. You can always expect excellent service, quick service, and helpful advice when you entrust your auto repair to our highly-qualified auto service technicians. Call us today to schedule an appointment for service. Ask about our available specials and financing options designed to make your auto repairs even more affordable and convenient.